If you’re going to do your radiant heat installation, do it right and go with the best in the business. Make it easy on yourself by going with Warmzone. They have an impressive selection of proven radiant heat solutions for residential and commercial projects. In addition this vast selection of top-rated products, they have forged relationships with radiant heat installation professionals across the country, and can bring you the service and support you need to get your project completed on time and within your budget. Thumbing through the phonebook can be hit or miss when it comes to the quality of radiant heat installation services you may find. Without a recommendation, it’s difficult to recognize the level of competence you are dealing with, or if you do, whether or not you can count on a professional to get the job done on time and within budget. Warmzone recognizes that a radiant heat system is only as good as its installation. To help connect you with the right professional for the job, they have created a large network of experienced Preferred Installation Providers (PIP). To ensure their success on the job, Warmzone provides ongoing training for construction professionals, and installation support for all of its customers. So you benefit from the peace of mind that comes with getting your radiant heat installation done correctly the first time. Another boon for customers is Warmzone’s complete design and engineering services. They’re provided with every Warmzone radiant heat system. Once you give them your project specifications, Warmzone can render a computer generated drawing for you. You’ll know the exact power needs and performance expectations going into your radiant heat installation, without the added hassle or expense of finding and hiring a contractor on your own. To further support you, Warmzone.com has created a complete library of online installation support information including manuals, guides, illustrations, videos and more for your projects, all available for immediate download free of charge, 24/7. At Warmzone, the goal is to conveniently provide clear information through their website. Partnering with Warmzone on a project gives you access to deep radiant heat specialists who are happy to address any concerns you may have about your radiant heat installation as they arise. Their consultants will work with you and guide you to the ideal system for your needs. They’ll give you sincere, non-biased recommendations based on your requirements and what makes the most sense, from a small remodeling project to a large commercial construction project. Above all else, Warmzone stays with you throughout the purchase and installation process to make sure that your system is performing up to expectations and that you are happy. Warmzone takes great pride in their commitment to delivering top-notch customer service. But the real proof lies in the great reviews Warmzone receives from its devoted customers. When you work with Warmzone, you are never alone. With a wide product selection, efficient system design, a large network of experienced installers, and expert installation support, Warmzone makes it easy! Call 888.488.9276 to find out more. Unlike most other providers, Warmzone has a dedicated staff of expert electricians, designers, and engineers on hand to assist you throughout the installation process. Furthermore, Warmzone maintains relationships with a large network of experienced installers to further ensure proper, hassle-free installation. In other words, Warmzone is committed to its customers and installers throughout the entire purchase, design, and installation process. You simply won’t find a more dedicated, accommodating and professional staff to work with. Besides high quality products at competitive prices, Warmzone provides unmatched customer service and complete design and engineering services along with expert installation support. Upon request, your radiant heat solution will come with a detailed, professional system design. Basically, you’ll know all the specs and power needs as well as performance expectations prior to any installation. Warmzone offers one of the most informative radiant heat websites around, and you can access a complete online library of installation support information including manuals, product guides, illustrations, installation videos, and more for your projects. It’s free and available whenever you need it. Like any home improvement project, radiant heat installation has its challenges. But with a wide product selection, professional system design services, a network of experienced installers and a dedicated installation support staff, Warmzone makes it easy for homeowners and contractors alike! Call 888.488.9276, and install your radiant heat system with confidence. 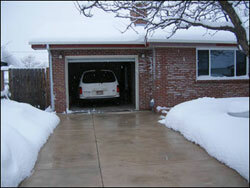 Maybe you’ve put your shovel down already by treating yourself to a radiant heated driveway system. But the benefits of radiant heat aren’t limited to heated driveways and sidewalks. When it comes to radiant heat, Warmzone’s got you covered from your head to your feet. Have you ever walked out of your home on a snowy day to be greeted by large, heavy icicles or the drip of melting snow on your head? Snow accumulation on rooftops is more than a nuisance if you don’t have a radiant heated snow melting solution to protect you and your home. As the snow melts and refreezes, it creates ice dams where the repeated freezing and melting of water finds its way under roof decking and eventually into your home. Plus, large icicles not only can damage your gutters or hurt people below, but drip onto the sidewalk, causing slick, dangerous conditions. Shoveling snow and salting the steps and walks are not always completely effective. Walking out your front door can be treacherous as you navigate slick, icy patches hiding under fresh layers of snow. Even with constant shoveling and steady applications of snowmelt chemicals, nothing can ensure the same level of safety as a radiant snow melting system. The good news is that the same radiant heat technology in your heated driveway application can be used for roofs, stairs, ramps and more. 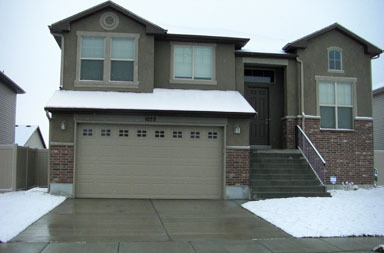 With Warmzone roof deicing and gutter trace systems, you can eliminate ice dams and snow buildup. And these energy efficient systems are fully automated and maintenance free. Say goodbye to icicles and the steady dripping that can form slick spots on your porch or walks as the temperatures vacillate. Available in cable right off the spool, polymer panels or paper-thin “Film” heating elements, Warmzone radiant heating systems are proven industry leaders that are unobtrusive and effective. The fully-automated feature means they only activate as needed to keep your areas free of snow and ice ‘round the clock. If you’re not ready to invest in a permanent solution, Warmzone also offers portable heated traction mats. These heated snow melting mats make it easy to enjoy the benefits of radiant heat on sidewalks, porches and even on steps. Just lay them down and plug them in. Made of non-slip rubber, they’re flexible and as durable as automobile tires, so they can withstand harsh weather and repeated use. The stair heating mats are available in rubber and aluminum. Because radiant heated snow melting mats come in different sizes, they can also be used for walkways, kennels, porches, disability ramps and more, providing a reliable solution for slip prevention. Keep your trafficked areas free from slick ice and snow. Whether you’re looking for an embedded snow melting solution or small, portable solutions, Warmzone has a number of great products to make your property safe and secure during winter weather. 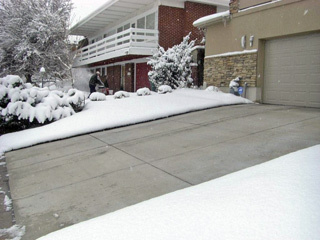 Call 888.488.9276 to learn about the many custom options for heating floors as well as exterior snow melting solutions. Warmzone offers one of the largest and most diverse selection of radiant floor heating solutions available. If you’re looking to install heated tile, hardwood or other floor types, you can be assured that Warmzone will have the ideal solution for you. 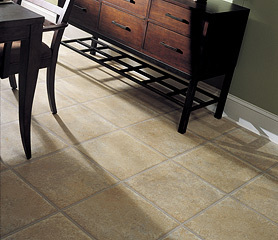 Radiant floor heating is particularly well suited for warming ceramic tile floors. Tile flooring not only adds beauty and elegance to a home, but tile heats quickly and retains warmth for long periods, making a heated tile floor a very effective, energy efficient method of heating. ComfortTile heating cable is the most highly recommended floor heating system for warming tile floors. ComfortTile floor heating cable can be purchased on spools as well as in mats. The floor heating mats feature heat cable that is pre-spaced with an adhesive-backed fiberglass mesh that can be rolled out for quick, simple installation. The 24-inch wide mats are pre-terminated for use with 120 and 240 volts, and are available in a variety of lengths. Thin metal straps are used to space cable that is purchased in lengths off a spool. The strapping is screwed into the subfloor and the cable is then secured to small eyelets/hooks at the desired space. CT heat cable is ⅛-inch in diameter and can be installed on a variety of subfloors, including: plywood, concrete, pre-stressed concrete panels, crack isolation membrane or any floor surface compatible with the mats’ adhesive backing. Depending on your subfloor, thinset or mortar is applied directly over the heat cable, followed by the installation of the tile. The ComfortTile floor heating system is an industry leader and comes with a 10-year warranty. ComfortTile is extremely versatile and can be used to heat virtually all types of floor surfaces, including marble, slate, laminates and hardwood. FloorHeat and FilmHeat feature thin heating elements that require no floor buildup, making these systems ideal for heating hardwood floors. Both of these systems can be used for heating existing floors as well. If you can access the floor joists from below, then you can install these heating elements – which can be stapled up between the joists.